Vitamins are fundamental substances constituting the human body, and essential for maintaining life activities. Although vitamins is vital for many biological activities, only limited amount of vitamins are needed. Vitamins have multiple functions in organisms. For example, vitamin D has a hormone-like function, and regulate mineral metabolism and tissue growth. Vitamin C and E function as antioxidants. Most vitamin B family members function as enzyme cofactors and regulate enzyme activities. 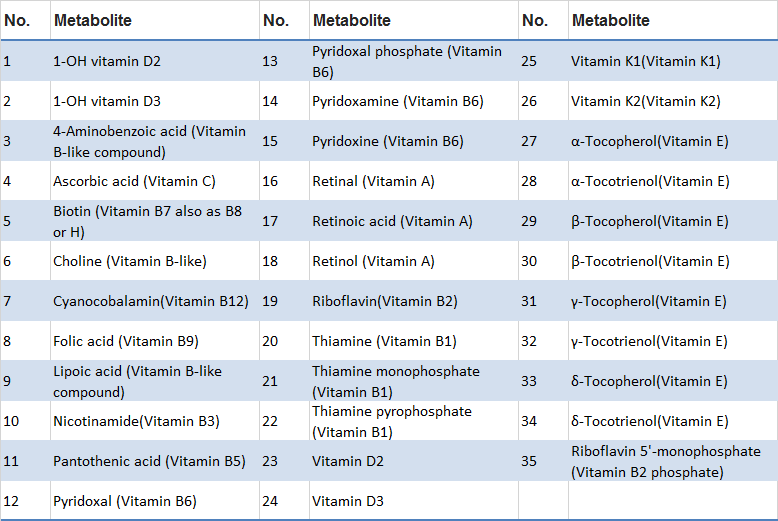 MtoZ Biolabs has established a platform for analyzing multiple types of vitamins. With our well-established analytical platform and optimized sample preparation methods, we are able to accurately analyze over 70 types of vitamins even in low abundance.